OKLAHOMA CITY, Okla. — The Oklahoma House of Representatives has advanced a bill that would allow the display of the Ten Commandments on public grounds and thus return the Decalogue display to the state capitol follow its removal in 2015. H.B. 2177, introduced in January by Rep. John Bennett, R-Sallisaw, passed 79-11 on Tuesday and now moves to the Senate for consideration. As previously reported, the measure recognizes the impact of certain documents on American history. “Every county, municipality, city, town, school or any other political subdivision is authorized to display, in its public buildings and on its grounds, replicas of historical documents including, but not limited to, the Ten Commandments, Magna Carta, Mayflower Compact, Declaration of Independence, United States Constitution, Bill of Rights, Oklahoma Constitution and other historically significant documents in the form of statues, monuments, memorials, tablets or any other display that respects the dignity and solemnity of such documents,” it reads in part. Other religions, such as Islam or Satanism, would not be included because they did not play a role in the founding of the nation. The bill only applies to the display of historical documents influential in the founding of the state or country. The measure also authorizes the attorney general’s office to defend the constitutionality of the display should it be challenged in court. The American Civil Liberties Union (ACLU) of Oklahoma opposes the legislation as it states that it elevates Christianity and alienates unbelievers. “Continued attempts to place a religious monument on the capitol grounds sully the deeply held beliefs of many Oklahomans, marginalize people of minority faiths and those of no faith at all, and amount to a monumental waste of time and money,” executive director Ryan Kiesel told the Red Dirt Report this week. “Regardless of what Rep. Bennett and other supporters of this misguided effort may claim, their actual intention is to elevate, for their own political advantage, an interpretation of one single faith above other faiths and above the conscience of those who have no religious faith at all,” he opined. As previously reported, the ACLU was at the helm of the 2013 legal effort to have the previous monument removed, as it asserted that the placement of the Decalogue on the grounds of the state capitol building was unconstitutional. The lead plaintiff in the case was liberal minister Bruce Prescott, the director of Mainstream Oklahoma Baptists. The case was fought up to the Oklahoma Supreme Court, which ruled in June 2015 that the monument must come down because it violates the state Constitution’s prohibition of government property being used to support religion. It was removed in the dark of night in October of that same year. 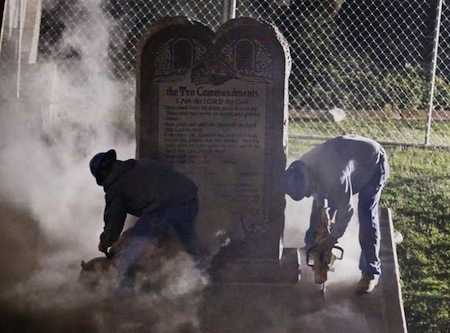 Last April, following the removal of the monument and a determination among some to have it restored, lawmakers approved a resolution to place the Ten Commandments controversy on the Oklahoma ballot. But the resolution was rejected by voters in November 57 to 42 percent. H.B. 2177 is believed to be another effort to return the commandments to the capitol.